The Stratus 1-Light Flushmount is uniquely designed with a contemporary feel. Finished in brushed nickel, it will be a great addition to any room. This light uses a high-efficiency fluorescent bulb (included) to save on energy costs. This uniquely designed fixture is the choice of discriminating yet value conscious homeowners who want to enrich their home. The13" Low Profile Wet Location Multi-purpose decorative LED Flush Mount from Lithonia Lighting features a bronze gasketed acrylic diffuser with a sleek, compact design. Choosing this energy-efficient LED lighting solution over incandescent will save you money on operating costs. Best of all, the LEDs last 50,000 hours, so you never have to change another bulb. ideal for use in closets, foyers, hallways, corridors, utility work areas, stairways, bathrooms and much more. The Mini 7" Round Low Profile Wet Location Multi-purpose decorative LED Flush Mount from Lithonia Lighting features a bronze gasketed acrylic diffuser with a sleek, compact design. Choosing this energy-efficient LED lighting solution over incandescent will save you money on operating costs. Best of all, the LEDs last 50,000 hours, so you never have to change another bulb. ideal for use in closets, foyers, hallways, corridors, utility work areas, stairways, bathrooms and much more. CounterBrite under-cabinet fixture combines a halogen lamp with a unique reflector design to provide an extremely wide distribution of light. Control with a wall switch or dimmer or use the integral switch located on the housing with convenient hi/lo settings. For direct wire installation. 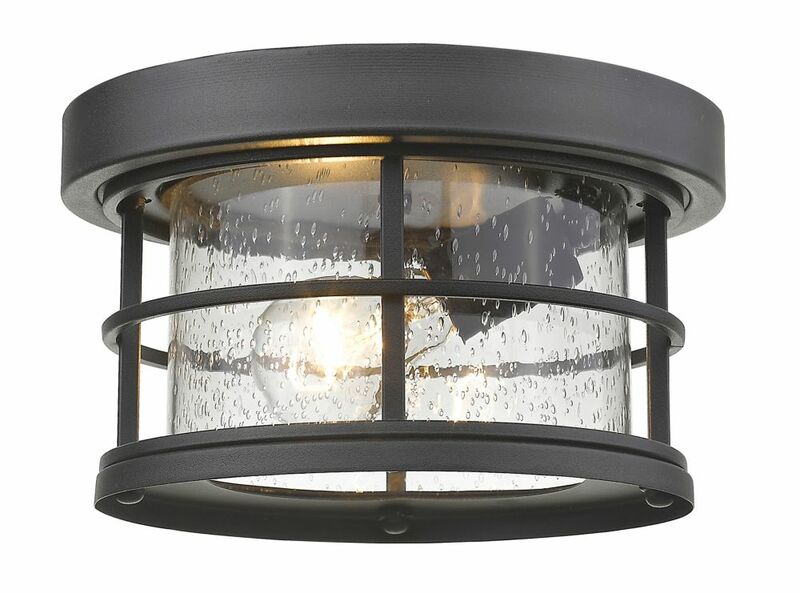 1-Light Black Outdoor Flush Ceiling Mount Fixture with Clear Seedy Glass - 10 inch This outdoor flush mount will update the exterior of your home with its eye-catching design. Featuring a black finish and clear seedy shade(s), this fixture will accommodate a variety of outdoor of dicor styles. With its easy installation and low upkeep requirements, this outdoor flush mount will not disappoint.